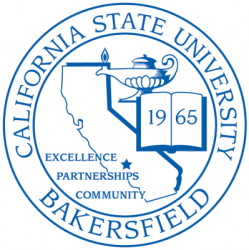 California State University, Bakersfield is one of 23 campuses of the California State University System. Located two hours north of Los Angeles, Bakersfield is a city of over 250,000 people within a diverse population of more than 700,000 in the southern San Joaquin Valley. CSUB serves over 8,000 students with a faculty of over 400 in four schools: Business and Public Administration, Education, Humanities and Social Sciences, and Natural Sciences and Mathematics.